Coaching is a subtle art that requires force of character, deep knowledge of the game, and an ability to teach and relate with players in a manner that inspires them to their best performance. In the League1 women's division, there are numerous coaches that fit this description, and in choosing the 2018 League1 Women's Coach Of The Year - the jury of League1 technical staff couldn't settle on just one. Meet your joint-winners of the 2018 League1 Ontario Women's Coach Of The Year Award! Under the new 2018 league structure for the women's division, for the first time a playoff structure was utilised in place of the single table format used in years past. This revision created a whole new ball-game for managers to cope with, as making the top four spots in 2018 left every chance for a title winning post-season run. 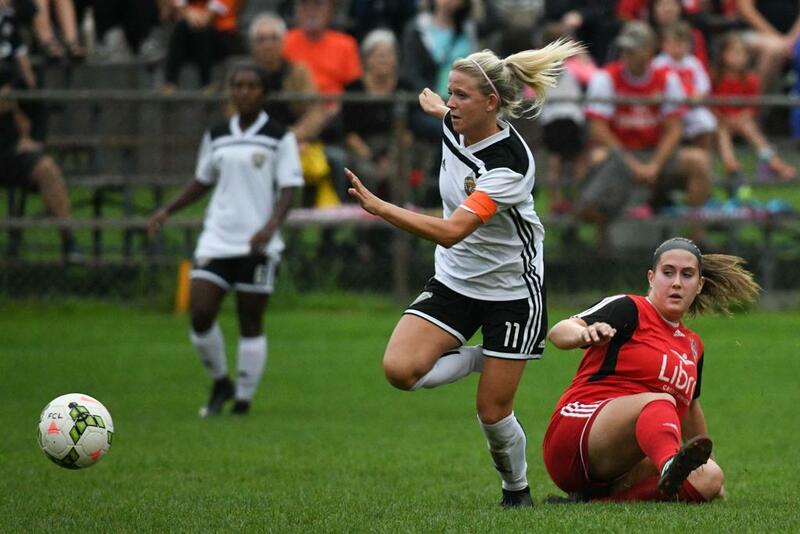 Under the stewardship of Mike Marcoccia, the FC London women's team was already a well decorated entity; two back-to-back titles in 2016 and 2017 - as well as a double-winning season in 2017 - had the Southern Ontario side as firm favourites going into the season. And Marcoccia did exactly that - expertly navigating the women's schedule with win after win in 2018, taking his team to the top of the table once again. London's clever passing game and the intuitive movement and scoring ability of forwards - especially eventual three-time Golden Boot winner, Jade Kovacevic - was in golden form. It seemed a third title was in the offing, but the new format required one final hurdle. Over in Durham, however, another force was emerging. Head coach Ramin Mohammadi guided his team back from a disappointing opening day loss to newcomers DeRo United to win five games on the trot. But in their seventh match Durham and Mohammadi came up against the London juggernaut, and dropped a loss at the German Canadian Club. Mohammadi again piloted his team back from disappointment, picking them up after a consecutive loss away to Woodbridge and matching the talent of midfielders and forwards like Holly Babut, Alicia Tamburro, Geneva Winterink and Laura Gosse with the defensive skills of Tamara Brown, Brianna De Souza and keeper Sara Petrucci to finish out the season with a four match unbeaten run. It all came back to a return meeting of Marcoccia and Mohammadi on the wet grass pitch at the German Club in London on August 25, where Durham demonstrated just how far they had come by breaking London's long-standing winning streak and home ground fortress mentality with a feisty 2-1 win. The chess match between the two canny managers was widely recognized as one of the most memorable contests of the 2018 season. Durham's resilience would ultimately continue, resulting in taking the 2018 Women's Championship in penalties over powerhouse side, Woodbridge Strikers, and ending the season as only the second women's team to ever win the League1 title twice. Two different pathways to the top, and two worthy managers for the year end distinction. 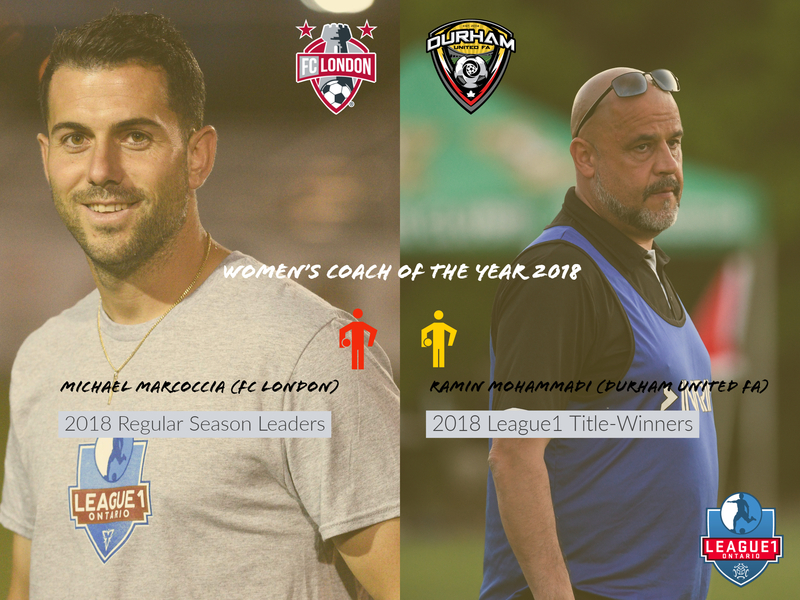 Congratulations to Mike Marcoccia (FC London) and Ramin Mohammadi as joint-winners of the 2018 Women's Coach Of The Year Award!